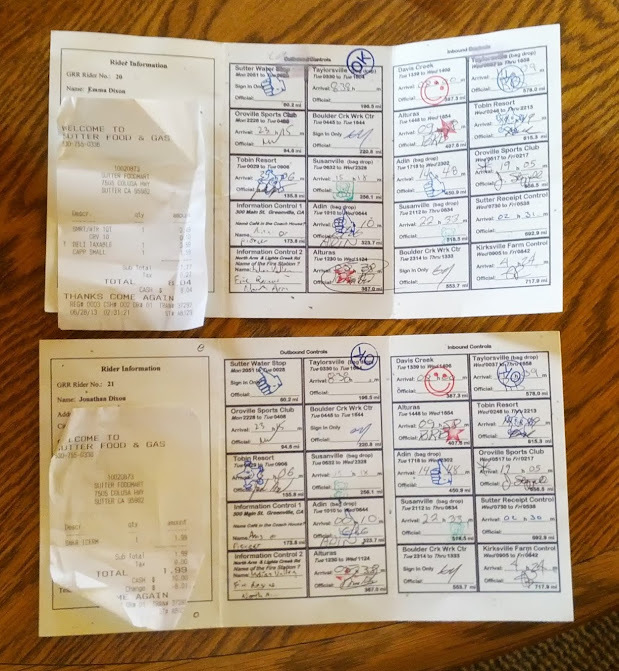 So, how to compress 1200km of riding lasting 3 ½ days, into a ride report? There were so many highs and lows on this ride, that I don’t think it’s possible to document them all. That’s one of the joys of randonneuring and the shared experiences create the most amazing bonds between people. Lets start at the beginning. The scene is Tandem Properties in Davis on Monday afternoon. The weather was not very Californian with grey skies and drizzle. Seventy odd riders plus volunteers, spouses, friends and supporters are milling around doing all the necessary tasks of checking in with lots of chatting and good humour. It’s an international field with riders from Japan, Australia, Canada, Russia, Korea and Sweden, although it’s the local clubs with the most representatives. San Francisco Randonneurs had many riders with a significant number starting their first 1200. Unusually, we were the only tandem riding, and there was also one velomachine and one recumbent. All of us ‘non standard machine’ riders had ridden the Davis 600, and so knew what we were getting ourselves into. - Storming to the first control at Sutter (96.9km), and arriving a couple of minutes before it opened. We lead out the whole ride for quite a bit of this stage. - Flying over the I-5 freeway for once we get the traffic light timing just right and lead our peloton past the yellow velomachine, normally uncatchable on the flat lands! - Being eaten alive by mosquitos after breaking a spoke on the front wheel, just after the Sutter control. Lycra is no match for the biting things, and I have bites everywhere which will stay with me for the next 1100km. - Gut wrenching sound of a bike going down hard at the back of the group we were leading into the Oroville control (152.2km). A couple of Japanese riders touched wheels and one went down very badly, breaking his pelvis. We’re too far down the road do anything other than hurry to the control to rally the support team’s assistance. - Hitting a pothole on the way out of Oroville and breaking a second spoke on the front wheel. We’ve never had to use a single emergency spoke in all our years tandeming, so using two in the first hundred miles of a 750 mile ride was rather concerning. - The delight as we managed to source three spare spokes which appeared to be about the right length from a SAG driver at Tobin (218km), and carried them for the rest of the ride before handing them back at the end. They were clearly charmed. - Falling asleep, exhausted at Susanville (412km) being disappointed that we’d not made it to our target of Adin (521km), but knowing that we were too tired to tackle the next remote, hilly stage. We slept for a couple of hours, before heading out to Adin where one of the controllers let us sleep in his car for an hour, as all the camp beds were full. - Leaving Susanville in a rainstorm, and seeing a double rainbow on the climb to Antelope Peak. - Descending to the tranquil Eagle lake with the setting sun -- twice! Both on the outbound and return leg. That is such a quiet and beautiful place. - Having to walk up part of the climb to the top of the GRR from the Boulder Creek side, and being very glad that no-one passed us. We felt very hot despite the rain, and with more than 350km in the legs, it was just a bit too much. - Climbing the fearful Janeville grade. According to Strava, I’m now Queen of the Mountain for the climb. Not bad given that “tandems can’t climb”, and we had a 10 minute break after the steep section to adjust clothing, take a photo, and eat one of the awesome sandwiches made for us at Susanville. - Singing ‘If you’re happy and you know it’ loudly at 2am on the approach to Sutter on the return leg. Making up foolish cycling oriented verses as we went. - All of the volunteers organising the ride and manning the controls. From the familiar faces of people we’ve ridden with this year, to the kids of the youth organisation 4-H at Taylorsville. The controls were relaxed, efficient with good food and excellent care. Everyone was fantastic, but the Taylorsville control was really something special. On the return leg (Thursday), one young girl remembered that we’d left a battery on charge on the outbound leg (Tuesday), and reminded us to collect it as we were on the way out of the door. Taylorsville has a population of 154, so to have them put together the skills and effort to run this control was great and made us riders feel like we had a real connection with the community we were passing through. - Stopping for an ice-cream on the way down Feather Canyon. It was really hot, and an ice-cream and glass of lemonade was perfect. - The care and concern of the SAG drivers. We caused some concern on the return leg, as we slept at a motel at Susanville on the return leg, and didn’t plan on returning to the control before heading up Janesville grade. One rider had overslept in a motel in Adin on the way out, and had to abandon as she was out of time. One of the SAG drivers went around to the motels in Susanville until they found out where we’d slept to ensure that it didn’t happen to us. As well as mechanical support they provided, they provided a welcome lift to see them pass you when on the remote sections of the ride. It’s good to know that there are people out there actively looking out for you. - Seeing Don Jagel sat beside of the road into Adin holding a kitten. He’d seen it in the road, where it looked like it had been injured, so dashed across to rescue it and look after it until someone could be found to take care of it. We went on to ask the controllers at Adin to see what they could do, but in the end a CHPs Highway Patrol Officer stopped and took it off him. - The epic tales of true endurance - the true spirit of this type of riding. From the rider who broke a crank and finished the ride on a bike and shoes borrowed from a rider who had just abandoned, to the rider who finished having ridden the last 400km with Shermer's Neck, to the riders who had problems on the outbound leg and struggled on until they ran out of time, or finished. They are the heros. - Last and not least, the organiser Dan, wife Ann and the wonderful support and enthusiasm of Davis Bike Club. They are a very special bunch of people to put on this ride. The next Gold Rush Randonnee will be in four years. It’s a ride to experience. It has some of the best support you can find anywhere, and the mountains are spectacular. It’s never going to be an easy ride, but can a 1200 ever be easy?